A roundup of articles, videos and more that we highlighted on Twitter this month. A new book from Ashley Bryan. See #2. 1. Paul McCartney. And a robot puppet. Dancing together in this video. Need I say more? 2. 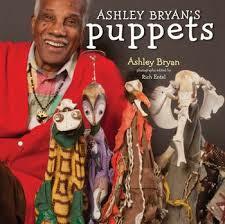 Children’s author Ashley Bryan makes puppets from found objects washed up on the beach near his home on Little Cranberry Island, Maine. Read this interview from Publisher’s Weekly about his new book of puppets coming out this summer. 3. ADORABLE tabletop puppetry is featured in the production Moominsummer Madness from Polka Theatre in London. Based on the stories of legendary author Tove Jansson, you should definitely check this out if you are in the UK. 4. A gallery of Drabbits from the fabulous Imaginarium Galleries in Pennsylvania. 5. I think it’s safe to say that Julie Taymor’s work on Disney’s The Lion King was the first glimpse many people had of non-Sesame Street puppets. It’s coming back to the Kennedy Center this summer. A round-up of articles and events we’ve highlighted on Twitter this month. Sleeping Beauty in performance. Photo by Gene Carl Feldman. 1. 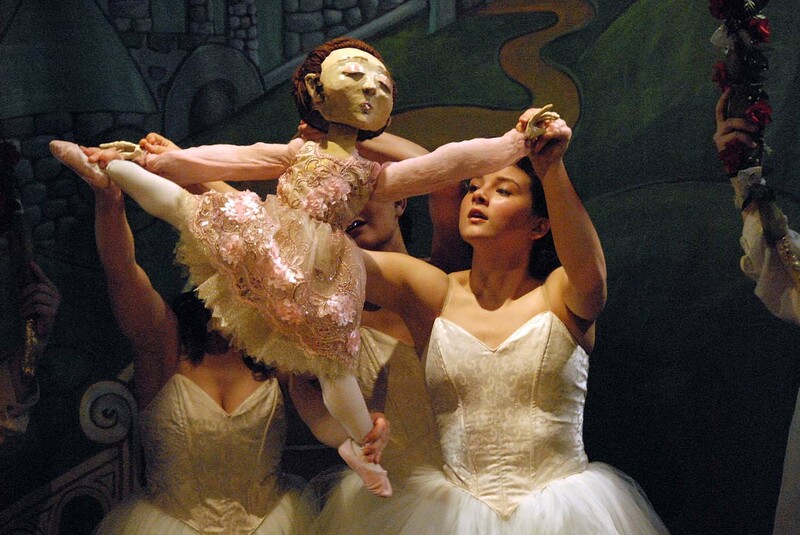 Pointless Theatre’s production of Sleeping Beauty: a puppet ballet has only one more weekend to run! You’ll be sorry if you miss it. 2. Elizabeth Hyde Stevens wrote this article for Salon about the Muppets and how they created Generation X. 4. Poncili Creacion was in town for one night this month. Find out more about the work of this Puerto Rican theater company that creates surreal puppetry on their tumblr. 5. 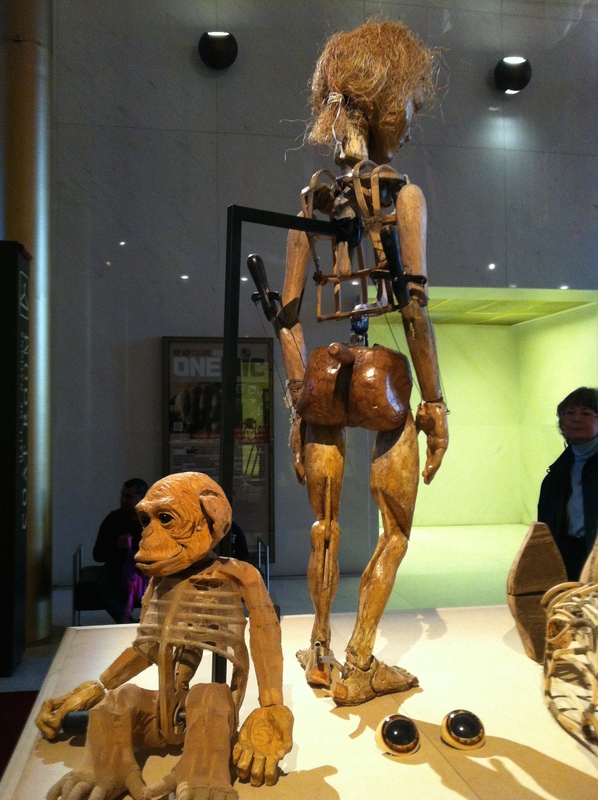 We were fortunate enough to see Ronnie Burkett’s amazing marionette show Penny Plain at the Kennedy Center (more of our thoughts here). For those interested in learning more about Burkett’s work, here’s an old interview from The Guardian. 6. Our favorite illustrator and key inspiration Shaun Tan has a new book out! It’s called Rules of Summer, read more about it on his website here. Joey, the title character of WAR HORSE. 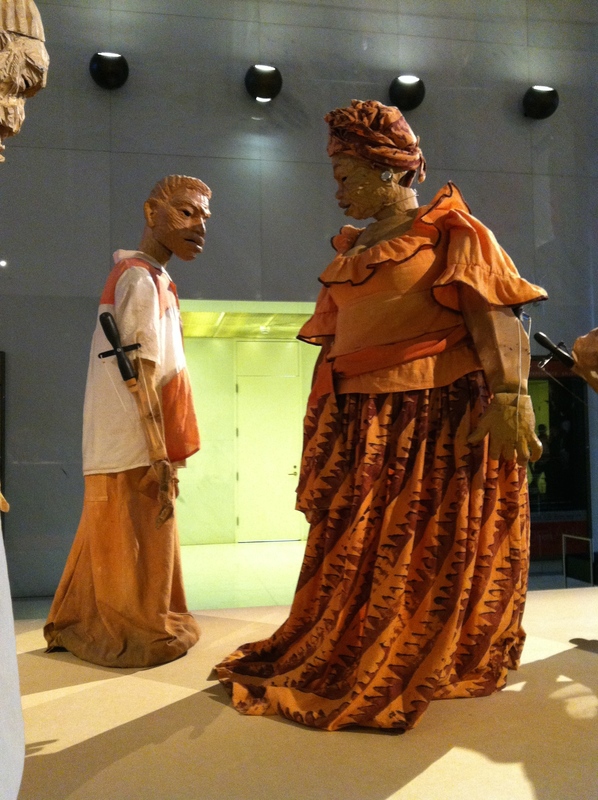 In addition to some fantastic puppet performances at the World Stages Festival, the Kennedy Center played host to several different art installations which could be enjoyed by the general public for free. Rod puppets by Handspring Puppet Co. The first installation, Raw to Real, was a series of puppets by Handspring, the South African puppet company best known for the life size horses from the show War Horse. The main equine character from that play is Joey, and he greeted audiences entering the hall. Up close, it was easy to appreciate the complexity of the controls and joints, the care that went into the building and the strain that is put on the wood with the movements of the multiple puppeteers it takes to operate. Animal and human puppets by Handspring. A series of video interviews with various people from Handspring gave insight into the construction process and their main material, which is wood. Additional screens played clips of shows featuring the puppets on display. 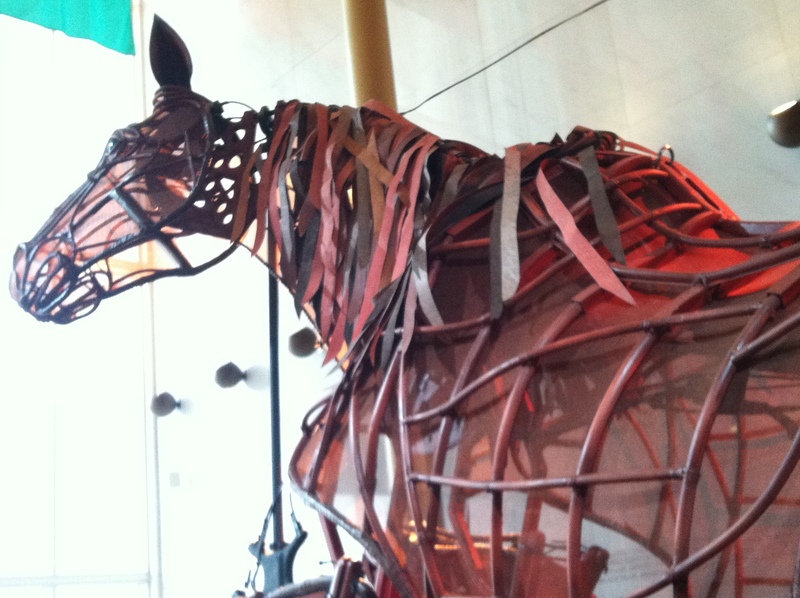 While War Horse uses life size puppets, many of their other shows use smaller rod puppets, around 3 feet tall. There were many of them, arranged in groups so you could see the relationships between them, some of them in pieces to give a better sense of the research and construction process. The engineering behind each joint is just as detailed and specific as the aesthetic of the face and costume. I really appreciated the fact that the puppets were displayed out in the open, in strong light and with video support to give a better sense of how the puppets operate in performance. While I love seeing different kinds of puppets and museum exhibits are often the best way to find them, it occasionally feels odd to me to see puppets frozen in one position–like any instrument, they are meant to be manipulated and played. Sondheim, with the cast of West Side Story. The second installation, Pequeno Teatro (Little Theatre) was by Rosa Magalhaes, an award-winning designer from Rio de Janeiro. This one was puzzling to me. 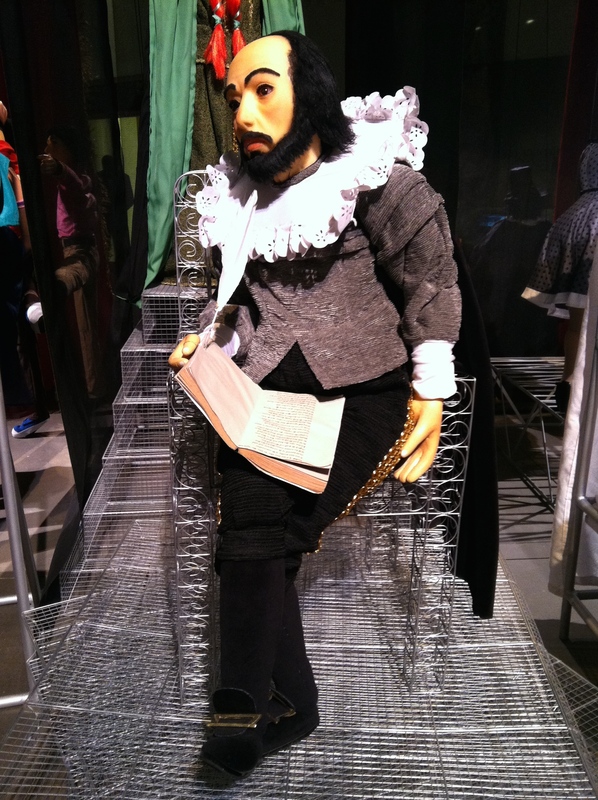 It was described as “puppets representing four theatrical writers from different time periods and regions of the world.” While it was fun to see which writers and works were selected, the objects themselves looked like dolls hung on cords, rather than puppets. There were no controls to be seen and it wasn’t clear at all how these ‘puppets’ might be manipulated. This of course begs the question “What makes it a puppet?” Is any object representing something else (in this case, playwrights and characters) a puppet? Even if they were not created for performance, are they still puppets? For me, what identifies a puppet is the intent to bring it to life, and that did not seem to be the case with this installation. 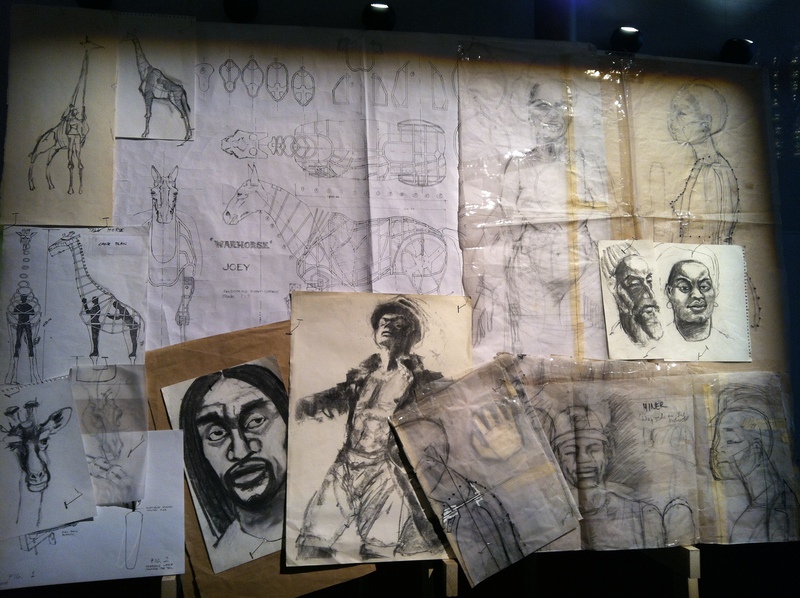 The designs were displayed and they looked like costume designs, with no thought given to how to manipulate and move the object–a far cry from the detailed engineering diagrams and studies of the Handspring puppets also on display. Puppet designs from Handspring Puppet Co.
I’m very glad that the Kennedy Center chose to give such a prominent position to puppetry at this festival. I applaud the decision to encourage other theatrical designers to experiment with the form of puppetry. I just wish this installation had been pushed a little further, perhaps as a collaboration with actual puppeteers, rather than allowing the playwrights and their characters to simply sit in their theater, with no hint of life in them.